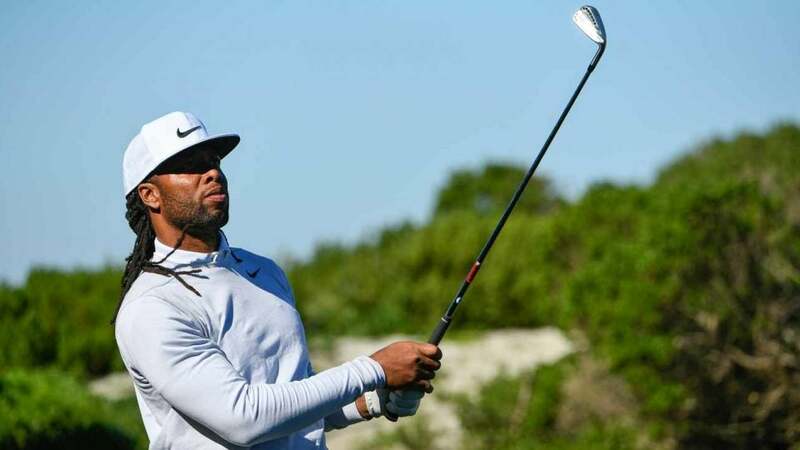 Larry Fitzgerald had a hole to remember at Seminole Golf Club on Friday. President Barack Obama played Seminole Golf Club for the first time on Friday morning, and Larry Fitzgerald gave him a reason to remember the round for a long time to come. The legendary Arizona Cardinals wide receiver hosted Obama, and the two played alongside club president Jimmy Dunne and Obama Foundation board member Glenn Hutchins. After Obama hit the green at the par-3 13th, Fitzgerald pulled 8-iron from 162 yards, hit the green and broke into celebration as the ball rolled directly into the hole for an ace. Seminole is an exclusive club in Juno Beach, Fla. and is home to what may be the world's most competitive member-guest: Dustin Johnson, Justin Thomas, Rickie Fowler and Rory McIlroy were among those teeing it up in last year's event. "Barack Obama played prestigious Seminole GC for the first time Friday morning, hosted by All Pro wide receiver Larry Fitzgerald in a foursome that included club president Jimmy Dunne and Glenn Hutchins, part owner in the Celtics and board member of Obama Foundation," Rosaforte wrote. "The elation coming from All Pro wide receiver Larry Fitzgerald on the 13th hole at Seminole GC at 1:30 this afternoon was unreal. But it was very real. So real that club president Jimmy Dunne waved the no cell phone rule on the course so Fitzgerald could deliver the message. "Dunne, who advocated for Fitzgerald's membership, provided the details. "Obama had just hit his approach shot 20 feet from the hole. Fitzgerald stepped up with an 8-iron and jarred it." "The stock shot is 165 yards from the blue tees to an elevated green that almost always plays into an Easterly breeze. It stands as one of the most beautiful holes on the property, with a green up against the sand dunes and the Atlantic Ocean. "It's considered one of the hardest 18th handicap holes you could find in golf. Fitzgerald, playing to a 10.7-handicap, hit 8-iron from 162 yards. Eye witnesses described the ball rolling in like a putt. Among the high fives was the one coming from the 44th President of the U.S."
https://twitter.com/TimRosaforteGC/status/1086292114642817025 https://twitter.com/TimRosaforteGC/status/1086333761938087936 https://twitter.com/TimRosaforteGC/status/1086334697368678406 https://twitter.com/TimRosaforteGC/status/1086337133630144518 https://twitter.com/TimRosaforteGC/status/1086337983630983172 https://twitter.com/TimRosaforteGC/status/1086340165692465152 Fitzgerald is no stranger to famous company on the course. He has become a pro-am regular, winning last year's AT&T Celebrity Pro-Am, and even teed it up alongside Tiger Woods during a casual round last year. https://twitter.com/FitzBeatSr/status/969583920881782787 There was also the moment Fitzgerald paused a post-game interview to check in on Woods at East Lake as he rolled in an eagle putt. https://twitter.com/CamCox12/status/1042920310641586178?ref_src=twsrc%5Etfw%7Ctwcamp%5Etweetembed%7Ctwterm%5E1042920310641586178&ref_url=https%3A%2F%2Fwww.golfdigest.com%2Fstory%2Flarry-fitzgerald-like-all-of-us-stopped-everything-he-was-doing-to-watch-tigers-eagle-putt-at-east-lake There's no doubt about it: Fitzgerald has the full-on golf bug, as a player and as a fan. And now he has an ace he'll never forget.